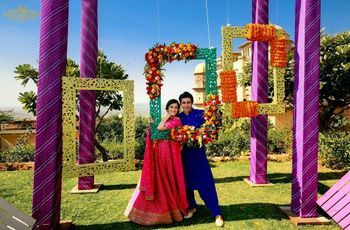 9 Indian Marriage Light Decoration Ideas That Will Breathe Romance in Your Wedding Decor | Wedding Tips ARE YOU A VENDOR? 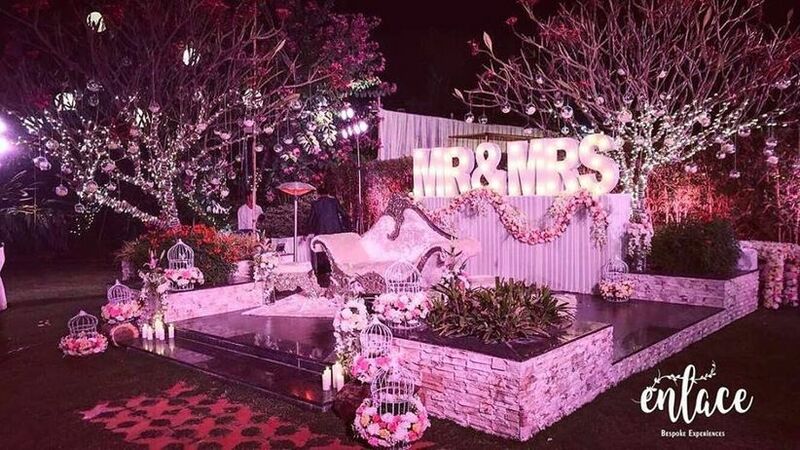 From candles and string lights to lanterns, we bring to you some interesting ideas on how gorgeous marriage light decoration ideas can be. 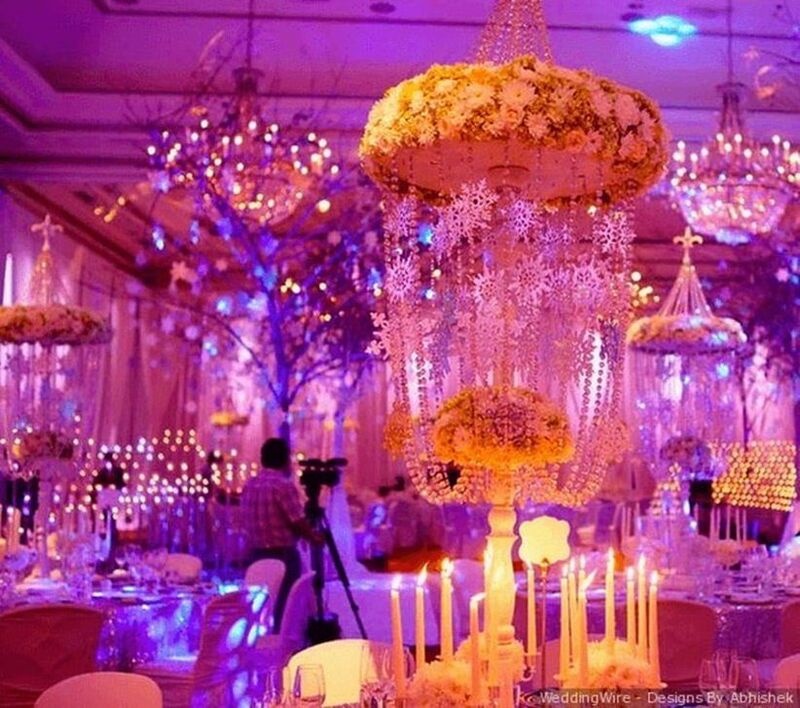 Decorating with lights comes to mind at once when thinking about elevating an ordinary wedding venue to something extraordinary. 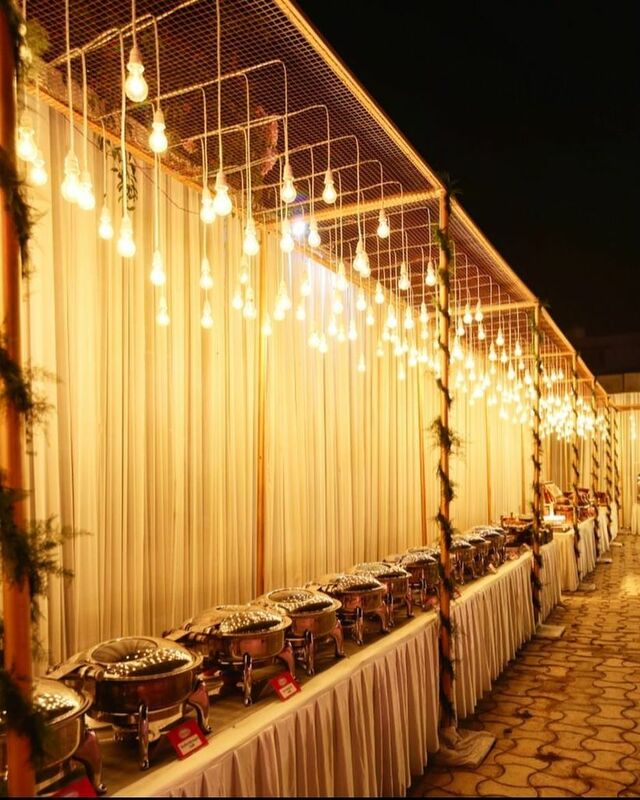 No matter if it’s an indoor or an outdoor space; different types of lights have the power to create a type of ambience that’s perfect for celebrating your big day. Take a note from these marriage light decoration ideas that are suitable for any season. Get inspired! When talking about marriage light decoration, you cannot underestimate the power of candles. To lend an amazingly romantic touch to your wedding venue, decorate the dining table with an arrangement of beautiful candles. 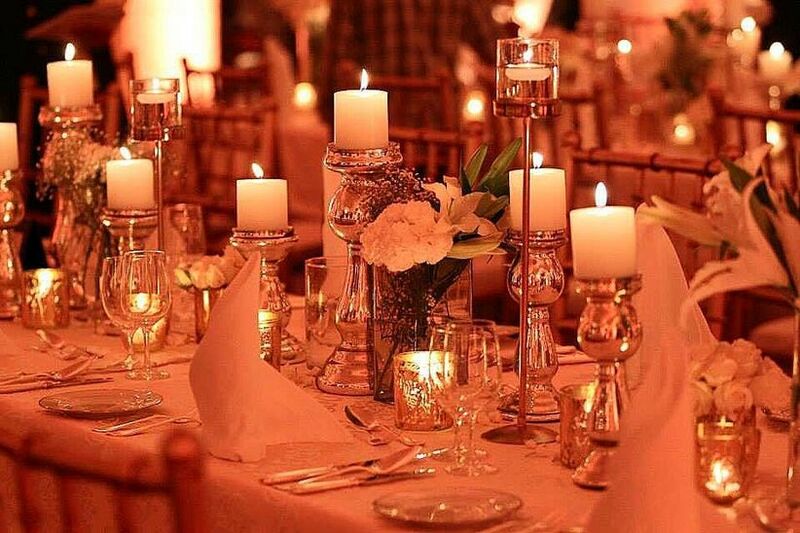 You can choose to go for candelabras or other candle holders for a dramatic effect especially if you have a night wedding. Also, you don’t have to necessarily opt for traditional white candles. Look for something that complements your wedding theme. String lights have the power to completely transform any space. 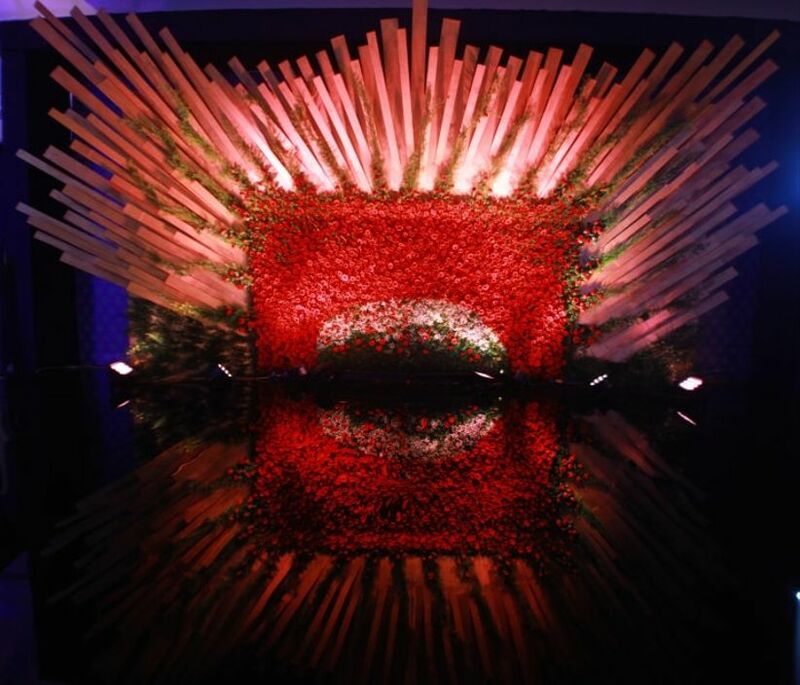 It is a versatile decor option that can add a glow to virtually any type of wedding venue. For an outdoor event, ask the decorator to add string lights to the trees and branches. Not only will it make space look gorgeous but it will also help to light the way for your guests as and when it gets darker. For an indoor event, you can have them strung over the dining table or use it as a backdrop for any of the sections. One of the loveliest marriage light decoration ideas ever. Whether it spells out the names of the bride and the groom, features your favourite quote, or simply says love, a gorgeous wedding sign is a great addition for a modern wedding. Better yet, when they are decorated with zero watt bulbs, string lights, or LED lights. The options are really endless! Hanging lanterns look lovely for all styles of wedding. You can hang them from trees or ceilings for a gorgeous effect. And unlike string lights, they are not just confined to be used for evening celebrations. You can also place them on windowsills, staircases, entryways, and tables. Did we mention they do double duty both as lighting and decoration? Another type of lantern that we cannot miss talking about is paper lanterns. 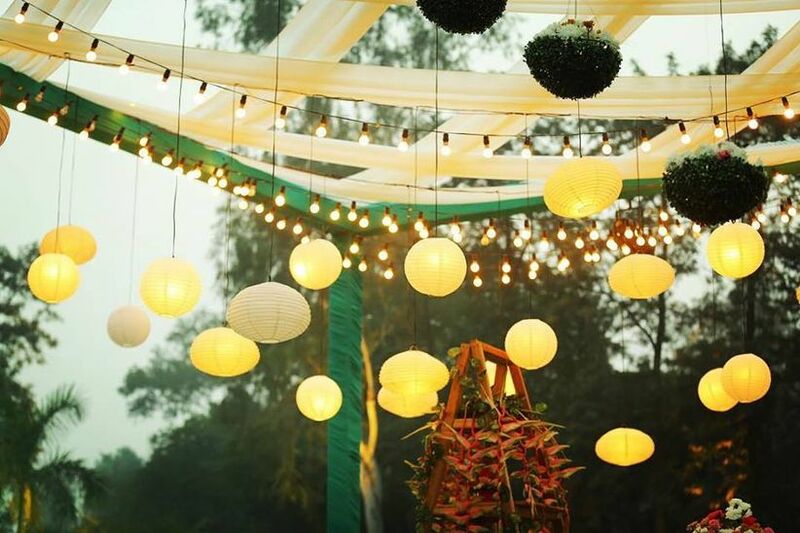 To create a dreamy decoration for your wedding day, put light bulbs or string lights inside them and hang the pieces from the trees or the ceilings. 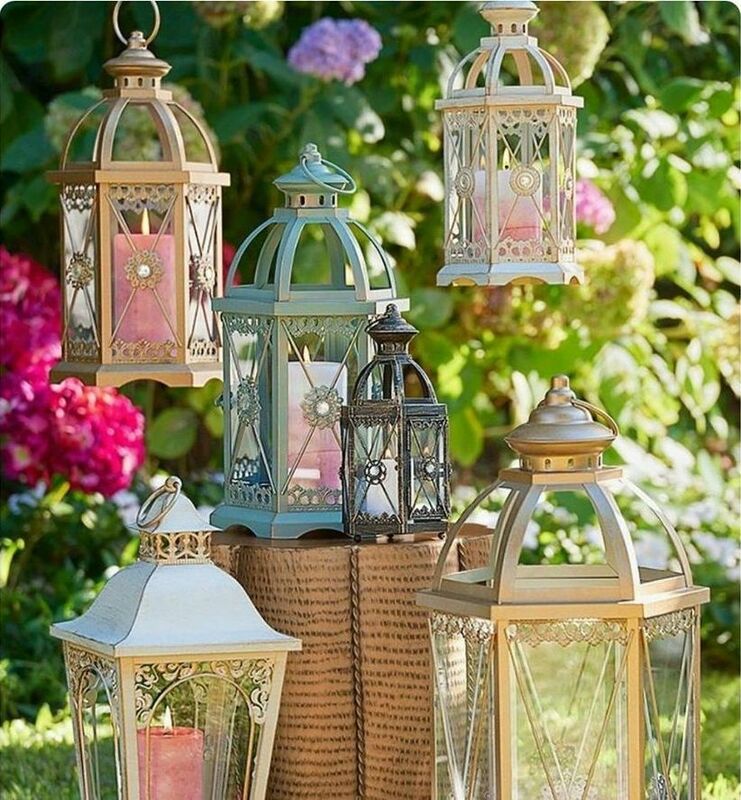 The soft light that will come out from these lanterns will create a stunning look. While white is the most common colour, you can get paper lanterns in a variety of shades to fit your wedding decorations better. The bride and groom sofa truly deserves all the attention you can give it. On your big day, all the eyes will be on the two of you and adding gorgeous lights will help to create the spotlight. 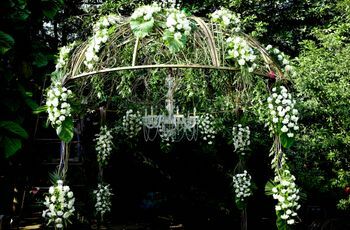 Lots of pictures will be taken in this area and the right lighting can help to create a romance that flowers cannot. You can choose to go all out with a variety of lights or keep it simple only with background lights. 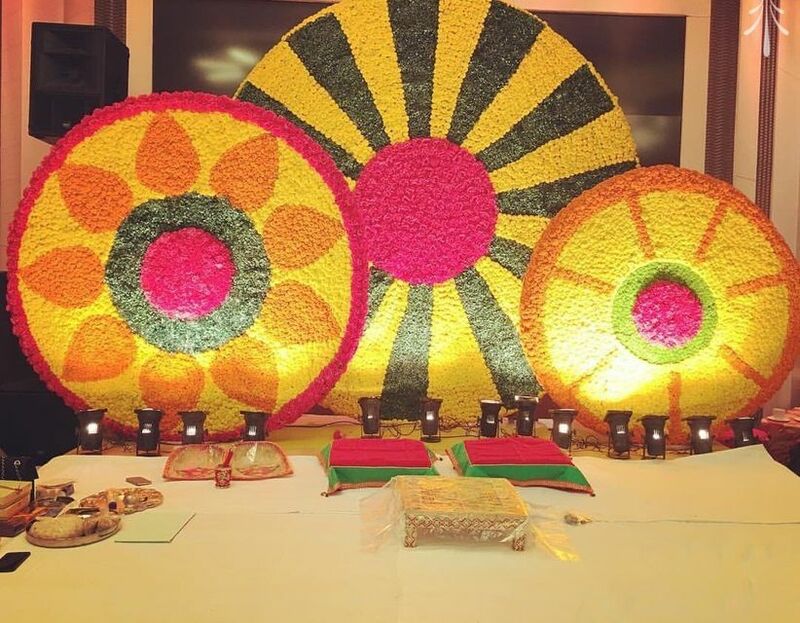 We can’t agree enough that an Indian marriage light decoration is incomplete without a fireworks display. 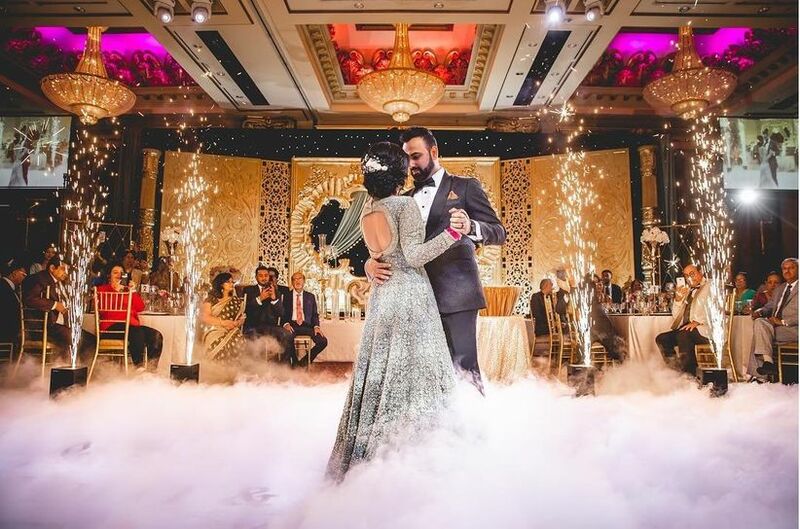 Although it has been a trend lately to use fireworks during Jaimala or the entry of the bride and the groom, you can go a step ahead by using them on the dance floor. When it’s time for a couple dance, sparklers can flare up from all directions to make your romantic moment all the more bright. Did we just spark an idea? Apart from this, you can also place mini sparklers in glass jars to light up the entryway or other areas of your wedding venue. Just make sure to use the ones that won’t shoot up. 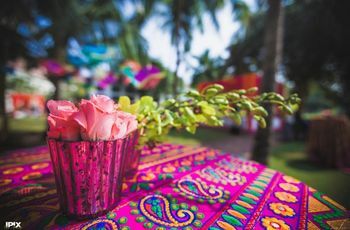 Using Diyas or battery operated lights to create a unique rangoli design with lights can be quite an attraction for your decor. 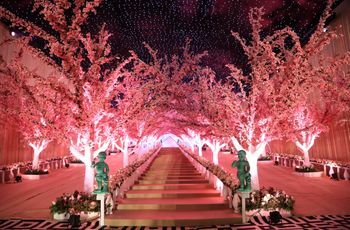 You can either cover the borders of your wedding venue or use the idea to light up the pathways. This is again a wonderful idea for night time events. 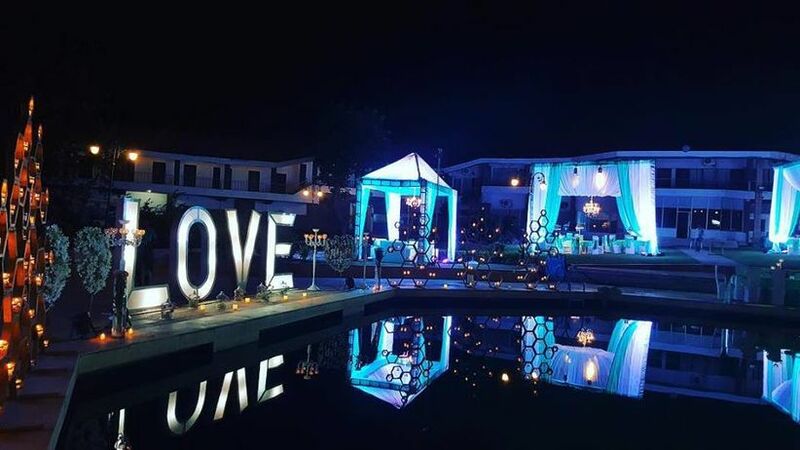 Another great and a very creative way to light up your wedding venue is with giant LED light up letters. To bring the wow factor to your big day, choose to display your initials, spell love, or the date of your wedding. These are some ways to incorporate beautiful lighting into your big day. 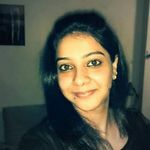 If done creatively, these ideas can really help to create a highly memorable ambience for everyone. And it goes without saying that the soft glow that the marriage light provides makes for some great looking for pictures as well. Have more ideas to get creative with these marriage light decoration ideas? Let us know through comments.